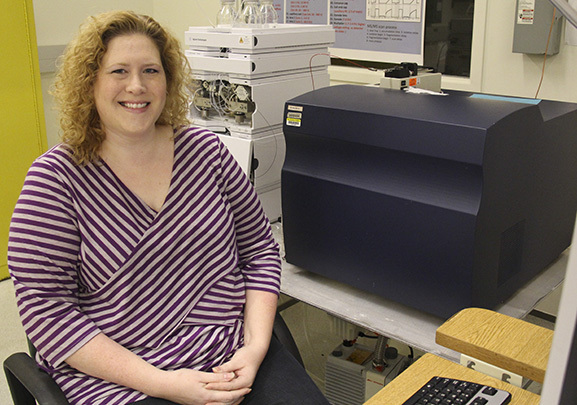 Dr. Laura Busenlehner, assistant professor of chemistry, with the mass spectrometer in Shelby Hall. Busenlehner’s research was recently recognized as “Paper of the Week” by the Journal of Biological Chemistry. Dr. Laura Busenlehner, assistant professor of chemistry at The University of Alabama, has received “Paper of the Week” recognition by the Journal of Biological Chemistry, a top journal in her field. Busenlehner wrote “Escherichia coli SufE Sulfur Transfer Protein Modulates the SufS Cysteine Desulfurase through Allosteric Conformational Dynamics” in collaboration with Dr. F. Wayne Outten, chemistry professor at the University of South Carolina. Busenlehner and Outten researched E. coli proteins and their interactions during sulfur extraction.  Busenlehner’s selection means that her paper is in the top two percent of manuscripts the journal will review in a year in significance and overall importance. About 50 to 100 papers are selected for this recognition from the more than 6,600 the journal publishes each year. This recognition exposes a vast network of researchers all over the world to the novel and important research being undertaken in Busenlehner’s laboratory, as well as throughout the University. Busenlehner’s paper will appear under “Papers of the Week” online in the table of Contents of the issue in which it will appear. The paper also will be included in a cumulative collection accessed from the Journal of Biological Chemistry website, www.jbc.org.